Exit I-45 at the Dickinson Exit (near mile marker 19), FM 517 (also called Main Street or Pine). There is only one exit in Dickinson. Procced to the right (East) about 2 miles. We are located just past Highway 3 and before the Rail Road tracks. You can park on the concrete in front of the garage door or proceed to the road just before the railroad tracks and turn left to pull behind the building and park on the concrete behind the building. Exit I-45 at the Dickinson Exit (near mile marker 19), FM 517 (also called Main Street or Pine). There is only one exit in Dickinson. Procced under the expressway (East) about 2 miles. We are located just past Highway 3 and before the Rail Road tracks. You can park on the concrete in front of the garage door or proceed to the road just before the railroad tracks and turn left to pull behind the building and park on the concrete behind the building. Turn Left from 146 at FM517. Drive about 3 mile. When you cross the Railroad tracks, we are the third building on the left hand side of the road. You can park on the concrete behind the building. Turn Right from Highway 146 at FM517. Drive about 3 mile. When you cross the Railroad tracks, we are the third building on the left hand side of the road. You can park on the concrete behind the building. The Bay Area Center is located approximately halfway between Houston and Galveston, just south of the Clear Lake area. This location places many motels nearby that span a variety of price and luxury levels. However, the nearest motel is the Day's Inn of Dickinson. 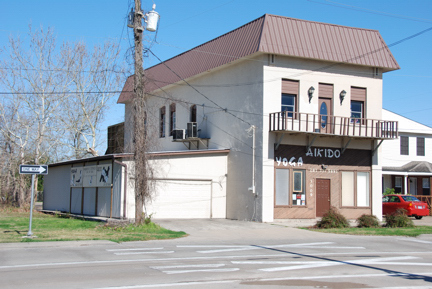 This motel is located on the feeder road of the Gulf Freeway (I-45) at exit 19, which is FM 517, also called Main Street. The Bay Area Center is also located on FM 517, approximately 3 miles to the east. The address of this motel is 3710 Gulf Freeway and it's phone is 281-534-9800.